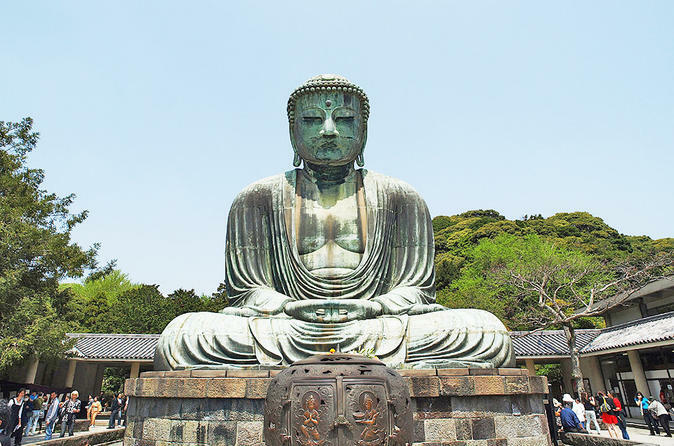 By booking this private tour of Kamakura by chartered vehicle, you can explore the city on a day trip from Tokyo with your group of family or friends in a private limousine, van, or bus, whichever is suitable for your group size. Visit sites like the Great Buddha or Kencho Temple, and enjoy traveling in a private setting, meaning you don't have to hurry for or wait on other passengers. When booking, select either a guided tour or a tour with a driver only, no guide. Your tour from Tokyo starts with pickup at your hotel by private vehicle and driver, as well as a private guide, if option selected when booking. Kamakura is a popular destination for its temples, shrines, and historical monuments, as well as Komachidori, a busy shopping street where you can try local food and drinks. All entrance fees, food, and drinks are at your own expense, giving you the flexibility to see and experience what you want; your tour route is customizable based on your preferences. When booking, please provide any specific attractions you want to visit or see. Perhaps you want to check out Tsuruoka Hachimangu, the city's most important shrine, or the 800-year-old Great Buddha, which stands 37 feet (11.5 meters) tall and weighs 850 tons. Shop for souvenirs, antiques, and Japanese sweets at Komachidori, or visit Hasedera (a.k.a. Hasekannon), a Buddhist temple. Also popular is Kencho Temple, where you can walk through a serene forest. Your tour ends with return to Tokyo for hotel drop-off.